If you listen to The Fantistics Insider Baseball Show on SiriusXM Fantasy Sports Radio, you know that Schuyler Dombroske and I talked quite a bit about Joey Luccesi the weekend before last. Interest was high in the 6-5/227 left-hander as frustrated owners tinker with the nether regions of their rotations in the early going. There was reason for the interest, however, because as of that weekend. Joey had posted three starts in a row allowing one earned run or less including a start at Coors. He then, of course, allowed 4 runs on 5 hits and 5 walks in his Sunday start at Chase. Joey was a 4th round pick in 2016 and he hit the low minors well behind the age curve at 23 years old. The Padres were not shy with him, and he gave them no reason to be cautious so he arrived at AA in the back half of last year, his second preseason, and pretty much had his way there. The results numbers were outstanding but his K rate took a big hit and he had the help of a 77% LOB%, a .259 BABIP and a 5.3% HR/FB rate. That, in a nutshell, is Joey Muccesi. He's basically a two-pitcher, throwing FB (90.3 mph)/Change (79.2) 97% of the time. That -11 is nice except hitters don't need to fear the fastball. You would think a two-pitch starter would struggle as hitters see him more but his second time through the order so far has been better than the first time through and he hasn't lasted long enough to see a third time through too often. His samples in the majors are still very small so it's almost useless to linger on them. And that's the rub here. When you hear about Joey's compelling skills, you hear about his pick-off move and how he limits walks and how he's athletic and likes dogs and long walks on the beach. It's like you are being set up on a blind date with someone who's looks, in this case Joey's stuff, is not partly impressive. And then you get the "Oh by the way..."
Joey's "oh by the way" is a rather awkward looking and annoying set of mechanics. From his pre-war style set (and by pre-war, I mean WWI) with his arms extended fully above his head, to his robotic and frustratingly deliberate ("Just throw the ball Norton!") wind up, to his drop and drive delivery. It's all funky, and not in a Parliament Funkadelics kind of way. It's more of a "my blind date snort laughs and is a vegan" kind of funky. This all adds up to a pitcher that we don't have a ton of history on, and that appears to be his biggest strength right now. His stuff isn't compelling, he's a two-pitch starter, and my concern is that hitters will get comfortable with him and his snort laugh and then things aren't going to be so rosy. I think he's a major league starter, at a back-end-of-the-rotation level, and will see some good pitching environments and matchups that you can cherry pick, but I think midnight is coming on his current level of performance. Don't spend up. This edition of Prospect Central seems to be turning into a pitching edition so why not go with it? 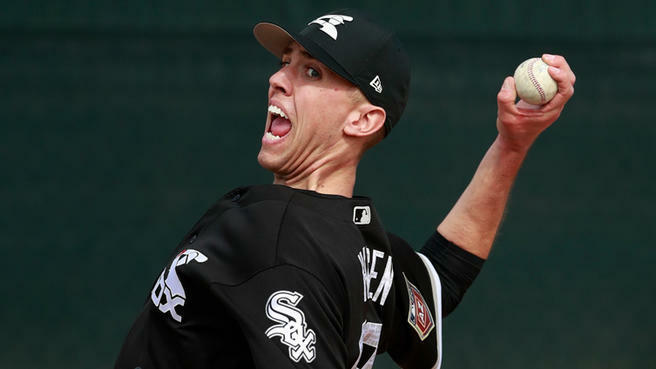 And while on the subject of the White Sox let's take a look at their 23-year-old, 6-7 right-hander Alec Hansen who is navigating his first tour in the high minors this year. There is currently an injury concern with Alec, but we'll get to that in the end. It's been a winding road for Alec who was taken by the White Sox in the second round after a horrid Junior year in college which dropped him from a top draft prospect to a reclamation project. He was allegedly healthy that year, so the story goes that he just lost command and control. I'm just going to let everyone have that because since he's become a pro, Alec has "found it" again. Alec can run it up in the upper-90s and he cruises mid-90s comfortably. His height adds downward plane, and his fastball does not respect the personal space of same-side hitters. It has good run. He can also go away from those hitters with an excellent slider with which he beats them. He has a change and it's good enough to give hitters pause. What Alec lacks is control and command. He's 6-7. It's a tale as old as time, a song as old as rhyme, repeatability of release ... This will be an ongoing problem until it isn't. Henry Owens never figured it out in Boston, Tyler Glasnow is still trying, Randy Johnson took some time but wrangled his mechanics to a HOF level. I am not sure where Hansen is going to fall on that scale, but there's time and I see enough ceiling here to make Alec an intriguing stash option. The injury concern is a tight forearm that cropped up early this season. Alec has already seen his return pushed back a couple of times, he has yet to throw meaningfully, and the level of concern is rising in the White Sox fan/press orbit. Still, so far no one is talking about the elbow so I am going to assume everyone is just being cautious about a lingering issue with a young arm. I am also going to assume this injury glass is half full and we'll have a "Remember when?" moment about this 6 or 8 weeks from now. I like Alec. I like his upside. But as always I am concerned about repeatability, command and control with a 6-7 pitcher. I have seen too much. The sum of all of this? One of the original Fantistics analysts, starting in 1999. 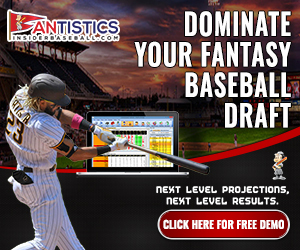 Currently serves as top prospect scout, along with hosting The Fantistics Insider Baseball Show on SiriusXM.